Unlock 50-80HP on your boosted vehicle while decreasing your air temps by up to 150 degrees! The all new Snow Performance Stage 2 Boost Cooler? 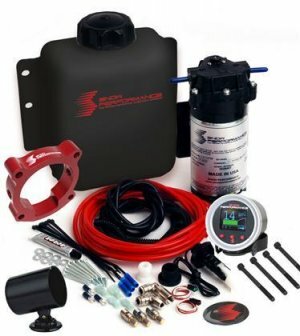 water-methanol injection system comes fully revamped in 2015 for all boosted (turbocharged/supercharged) vehicles and uses a progressive gauge style controller that proportionally injects more or less according to boost pressure. Start and full points are adjustable for engagement and delivery curve to match what the engine requires. Proportionally injecting according to boost pressure gives an accurate delivery of water-methanol and allows cooling and performance improvements over a wide range for improved drivability. Taking it one step further, the Stage 2 has the ability to progressively command 2 Hyper-Sonic? Nozzles independently of one another. This sophisticated dual stage injection management yields the highest increases in HP and cooling along all stages of the engine allowing you to greatly increase the boost & timing of your vehicle safely. Proven to deliver 50-80 HP and cool inlet temps up to 150 degrees!